Dancers from the Artichoke Dance Company sway through the trees at The Soraya. Photo by Luis Luque. A single flute carried the rhythm that floated tranquilly through the courtyard of the Younes and Soraya Nazarian Center for the Performing Arts at California State University, Northridge. Traditional drums followed, creating a stream of music on campus. On cue, a troupe of dancers outfitted in plastic flowed through the space, ​​weaving through a crowd of students and other onlookers. The Soraya presented an all-day festival, “Future Currents: Los Angeles River” on Friday, April 5. The festivities attracted locals and artists and featured live music, dance and art in tribute to the Los Angeles River. Future Currents highlighted some of the ecological issues relevant to the future of the river, such as waste and invasive plants. The Soraya staff and collaborators prepared for this multidisciplinary festival for more than six months, with the help of LA-based artist and eco-activist Steve Appleton and one of the nation’s leading eco-artists and choreographers, Lynn Neuman. CSUN student artists and filmmakers accompanied the two to the city’s Frogtown neighborhood to learn about the fast-growing and invasive Arundo donax reeds, which clog waterways and impede the river’s ability to contain floods. It was during these visits to the river that they found inspiration to collaborate with the two artists. The students were driven to craft their own stories of the river and create instruments out of harvested Arundo donax. 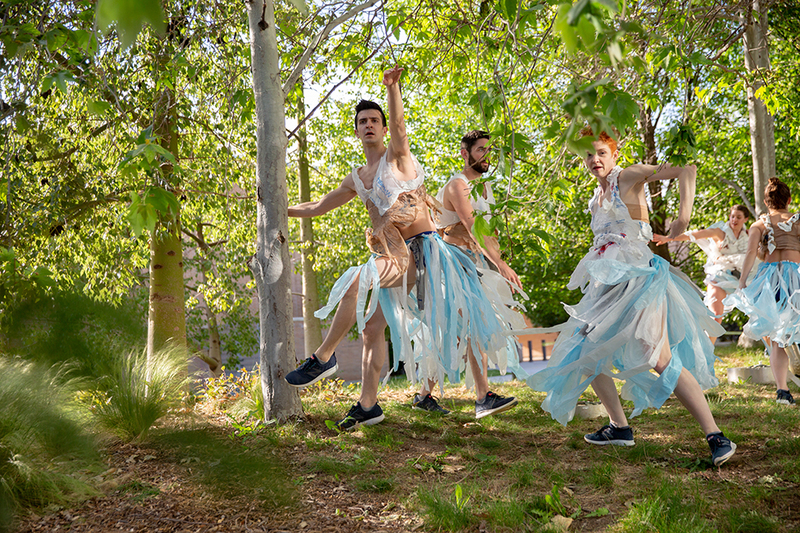 The collaboration between the two environmental artists culminated in the dance piece “Visioning Bodies,” choreographed by Neuman’s Artichoke Dance Company. Six dancers from the group moved to and from each other, in flows and ebbs. Their costumes were crafted from plastic bags that were scattered, torn and picked from the river — Neuman’s tribute to the plastic bag ban in California. Like a river, the dance flowed throughout the courtyard of The Soraya, making its way down the bend toward the grassy area where Appleton had displayed his reed-crafted “Alluvial Wave.” The dancers, draped in blues and plastic whites, drifted through and around the reed instillation as CSUN dancers, also draped in plastic, moved slowly in sync in the foreground. In addition to performances, hands-on workshops and activities at the festival encouraged students to get involved with environmental activism. ​​For example, visitors were able to create their own flutes out of the invasive reeds. “We are becoming more conscious, especially our generation. I feel like we are headed for a change,” said audience member and high school student Brianna Arriola. Learning how to properly recycle and compost was her favorite activity of the day, she said. The event told stories of the LA River through different mediums. While CSUN is a driving force in the CSU system in terms of sustainability, there is still a need for more student awareness ​​about issues affecting our environment.